"Easy to use, great performance, recommend to all my clients"
Background: I'm a freelance web developer who often works with companies looking to also use some kind of email marketing client, SEO, etc. I recommend Pinpointe to every single one of my clients. It's an easy-to-use application, the support team and development team are very responsive and helpful, and it hits all the right notes for managing contacts and sending marketing emails en masse. My clients have solved one of their biggest issues using Pinpointe - how do I reliably communicate marketing material to and manage all of my customer contacts? With integration into SalesForce, and an API available, my clients love the robustness and reliability of Pinpointe, as well as the ability to integrate it into their existing workflows. "Finally, an email platform that fits our business "
Email marketing is a substantial part of my business, and I wouldn't trust it to any platform but Pinpointe. I can create and schedule messages, send emails based on a subscriber's behavior, and even plot out drip campaigns to nurture new leads. The testing feature is truly unique. Pinpointe can run a split test for me and send the best email to subscribers automatically. It's such a cool feature that saves me a lot of time. I haven't found anything that I dislike so far. Even their support staff is awesome. They respond to email questions quickly and have even reviewed campaigns for me and given feedback. Since I send a lot of emails, I need features that save me time like automation. With Pinpointe, I get the features I need to reach customers without spending days in front of my computer. 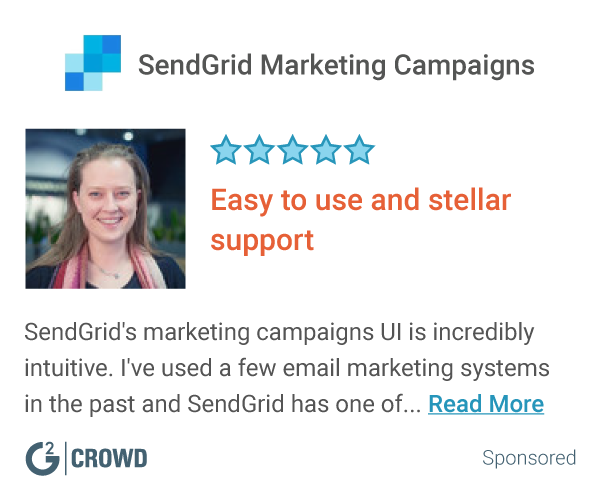 "Fantastic email marketing tool for our medium-size business." Personally, my favorite feature is being able receive a granular report of email campaign statistics. To find out how many bounces, unsubscribes, opens, and clicks is very useful information to use when it comes to moving forward with the leads/prospects. This info can be extracted into an excel file which helps sharing this information a breeze. Depending on the amount of contacts, when I'm in the middle of uploading a list I get bumped out and have to submit a request to increase my dataset. This costs a bit of extra time but nothing major. Templates can be easily personalized to fit your company's brand! We're getting much more in depth statistics of what our email campaigns are providing us with. It's helpful for us to see exactly what's happening with the emails we're sending out thus enabling us to tweak our methods. "#1 Email Marketing Service by Far"
​Inbox / Deliverability has been better than other systems​ we​ tested. Pinpointe doesn't have a price point for small senders, or a free account. Pinpointe targets higher volume senders and Enterprises. Highly recommended. I have used several other services and Pinpointe has been the best by far. We've been able to grow our mailing list, maintain current subscribers and increase engagement drastically. "I've been using Pinpointe for 3 years for more than one business"
Tools that allow me to create campaigns without coding and to test and preview them in multiple browsers and email services (how will my it appear in Yahoo, Gmail, Outlook, etc). They don't have a free account for people with tiny lists, but they give a 2 week trial. Do the 2 week trial and have support help you to make the most of the trial. My emails used to look different in different browsers, which made coding very difficult. Their drag and drop designer is very helpful in making emails that work across platforms. I only got to experience it last year but u really enjoyed the program put really helped me at work. The deliverability is also better than any other system we have tested and they include great testing tools allowing for multi-variant/split testing. My favorite tool is the inbox preview which shows you 25+ inboxes and includes a pre-flight spam checker. Currently I am using their Enterprise edition which allows me to create dedicated sub accounts with an administrator account and additional configuration options. "They will make it work for you !" "Pinpointe is a Critical Component of Demand Generation & Nurturing Campaigns"
Pinpointe’s email marketing solution is one of the few email vendors in the market that is able to meet our closed-loop marketing objectives. Our marketing department needs to accurately track and analyze our email marketing program efficiency and Pinpointe has advanced targeting and segmentation tools that go beyond the basics of simple email marketing. It’s also important for us to be able to send personalized and targeted emails on behalf of our sales and lead development teams. With Pinpointe we can choose, for each contact in our database, whom each email campaign appears to be coming from. Great tool for our needs - they continue to improve various features and the UI as well to continue to make the system very easy to use. It's easy to create emails and to track your open rate. The spam checker is great. Low deliverability rate. It seems like nothing ever makes it to the inbox. During tests, I started finding that many emails were not even making it to certain providers and were blocked before ever even getting there. They weren't even going to spam. I eventually left pinpointe and have much better results elsewhere. It allows to increase return traffic. Really user friendly, good navigation, helps a lot. Set up was difficult initially but was manageable. Do your research and find out if it’s the right product. There are many alternatives equally as good so find the right fit for your company ! "Great reliable system for sending information "
Simple and thorough. Easy to teach new employees to use. There is not a whole lot of things that really bother me about this. Just helping to be more organized and thorough with the whole process. Good analytics, easy to export reports. Nice templates. Fluid, easy to use. Color isnt bland. * We monitor all Pinpointe On-Demand reviews to prevent fraudulent reviews and keep review quality high. We do not post reviews by company employees or direct competitors. Validated reviews require the user to submit a screenshot of the product containing their user ID, in order to verify a user is an actual user of the product. Hi there! Are you looking to implement a solution like Pinpointe?